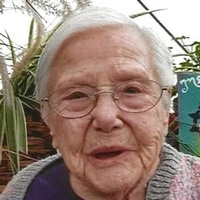 Irene L. Dougherty, 98, of Echo Township died Friday, December 28, 2018 at Grandvue Medical Care Facility in East Jordan. She was born August 20, 1920 in Rapid City to Ervin and Mildred (Atkinson) Hart. She married Versel Crawford on May 5, 1939 in East Jordan where they made their home. Mr. Crawford died in 1969. On May 8, 1971 she married Henry Dougherty in East Jordan. Mr. Dougherty died in 1991. Irene was a homemaker who enjoyed playing cards and being with her family. She enjoyed bowling for 35 years. Surviving are her daughter Evelyn Graham of Echo Township; 5 grandchildren; 19 great-grandchildren, and 18 great-great-grandchildren; a step-daughter Diane (Victor) Ayers of Boyne City; 4 step-grandchildren, 5 step-great-grandchildren, and 13 step-great-great-grandchildren. She was preceded in death by her husbands Versel Crawford and Henry Dougherty, her brother Walter Hart, and son-in-law David Graham. The funeral service will be at 11 a.m. Monday, December 31, 2018 at the Lighthouse Missionary Church in East Jordan with the Rev. Jim Jordan officiating. Visitation will be from 10 a.m. until the time of service. Burial will be in Sunset Hill Cemetery, East Jordan.